Today was easily the warmest day that I have experienced in Sitka so far this summer. I had two tours to work today, with the first landing near Pt. Brown and the second a trip south with a landing at Calligan Island. Weather: Sunny and warm, with light wind. Birds: I saw a flock of about 4 large shorebirds flying over Crescent Harbor around the time of our first departure. Between tours I saw another fly over just outside of Crescent Harbor. I do not know for sure what they were, but I suspect they were yellowlegs. 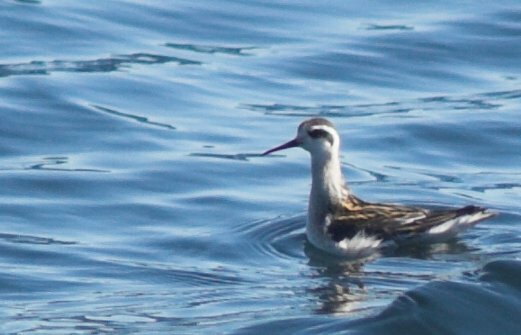 I saw several flocks of what I believe were Red-necked Phalaropes. There was a black and white alcid that I think may have been an Ancient Murrelet, though I did not get a good enough look at it to be sure. It looked like the young eagles were starting to fledge at the nest in the Kasiana Islands. Flora: At Point Brown, the group I was with seemed determined to hike back in the woods, so we ended up making it back to the muskeg. The flowers seemed to be mostly finished where we saw, but there were a few apargidium flowers still hanging on. At Calligan Island I noticed crow berries ripe on some of the taller rock outcrops on the beach that were covered by moss and crowberry plants. Other Notes: There were a couple of sizable rafts of sea otters near Fragrant Island. Several humpback whales were still active near Vitskari. We watched a couple of seiners fishing for sockeye at the entrance to Redoubt Bay. The net we saw pulled in did not produce a large haul, but it did have quite a few fish in it. There were several sets of deer tracks in the sand at Pt. Brown beach. This entry was posted in birds, daily, deer, marine, photo. Bookmark the permalink.